Did you receive a DVD that was created in PAL format from someone in Europe? If yes, you might not be able to play it back without a DVD player that PAL supports or a PC that is able to play back content in PAL format. A solution to this would be to convert your PAL DVD to a digital file on your computer or convert the file to a DVD that is NTSC compatible. Keep reading to know more about how to play PAL DVD. To play PAL DVD in USA, you need to understand that it’s the differences in the standards that make the PAL DVD unplayable on many American players and the other way around. Therefore, you have to convert your PAL DVDs to NTSC, which is used throughout America, before you can play any European PAL DVD on an American-based NTSC player. You can do this in many ways, but a simple option is introduced below. Here, Aimersoft DVD Ripper is the recommended program to rip your DVD videos to computer. This tool can rip both the NTSC and PAL DVDS to all the regular video formats such as AVI, MPEG, MP4, MOV, WMV, MKV, FLV and more. It can reduce the size of the file without interfering with audio and video quality. Have no experience in ripping and converting DVD at all? Don’t worry, Aimersoft DVD Ripper will do all for you and it is extremely easy to handle even if you are the first time to do that. Install and run DVD ripper on your Windows-based computer. (Mac users please install Aimersoft DVD Ripper for Mac, which is developed for Mac OS X (Mountain Lion / Mavericks.) Now follow the steps below to convert PAL DVD immediately. Insert the DVD disc into your computer drive and then choose and drag the DVD files that you want to convert into the main window of the program. Another way to import files is to click the Load DVD Files button. Then choose an output format. 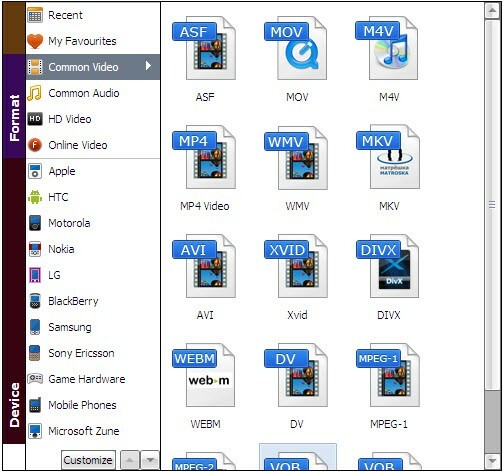 Usually, popular format like WMV, AVI, MP4 can be play smoothly in Windows. Each format parameters can be customized. You can adjust them as per needs or just keep the original settings. Before beginning the conversion, you can edit the DVD files as you wish. When all settings are done, click the Start button to activate the ripping process. You will get the output files in a few minutes and now you will be able to play PAL DVD without any hassles. Open My Computer and choose the option for Properties. After that, click the Device Manager and double-click on the DVD/CD drive. Right click on the installed DVD drive that is needed to play your PAL movies. This is if the computer has more than one drive. Choose the DVD region from which to play PAL DVD. The packaging will have the printed number for the exact region. Note that this region setting can only be changed a maximum of five times. PAL, stands for Phase Alternating Line, and it’s a color encoding system that is used in analogue television in broadcast television systems in many countries which broadcast at 576i. SECAM and NTSC are other common systems for analogue television. The stand-alone DVD players can only play NTSC or PAL, with the region code staying the same for the player. You can play PAL DVD on computer, switching between PAL and NTSC a few times. The DVDs sold in the United States come with the NTSC standard features, the system that is used throughout North America. The NTSC video will play at thirty frames per second, with each having scan lines of 525. PAL is the dominant format in Europe and it plays at twenty-five frames per second, each with scan lines of 625.